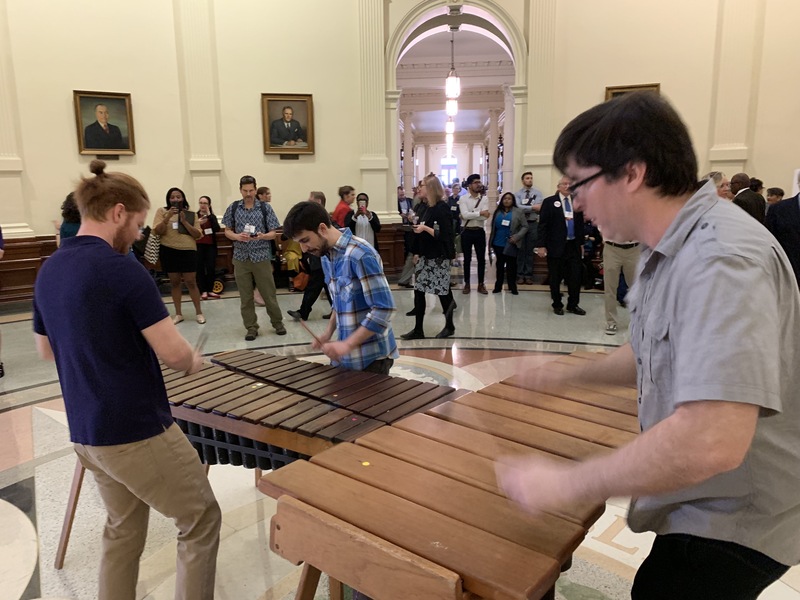 The Kupira Marimba Trio has the pleasure of performing in the Rotunda of the Texas State Capitol for Texas Art’s Advocacy Day! Texas Arts Advocacy Day included advocate training sessions, speakers sharing their expertise about TAADs legislative agenda items, performances in the Capitol Rotunda, lunch, and most importantly provided people with a chance to meet with their elected officials’ offices to ensure they know how important the arts are in our communities all across Texas and to urge their support of our arts-centric legislative agenda. The arts change our lives and transform our communities! Please join us to speak up and play a vital role in advocating for a strong public investment in the arts. 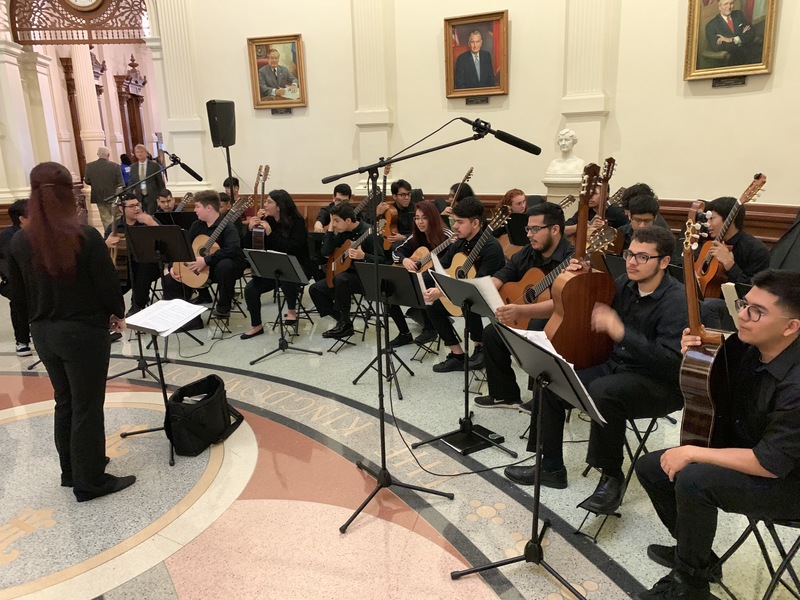 It is important that our Texas State Legislators hear from each of us about how the arts benefit our lives, our communities, our school children, the Texas economy, and much more! * Hear about their new economic and arts education impact report providing valuable data and perspectives from across the state. between TFA and THLA, and what to watch out for in the 86th. Discuss the impact of Cultural Districts and our work to restore $5 million to the TCA Cultural District grant program. Learn about the $500,000 TCA “Exceptional Item” request and how these funds could support a breadth of programs that use the arts – easing veterans’ transition back to civil society or supporting formal art/music therapy programs addressing mental health needs. Demystify arts advocacy through role-playing and what-works-and-what-doesn’t to prepare you for your legislative visits. Closing Remarks – The Impact of Your Voice! 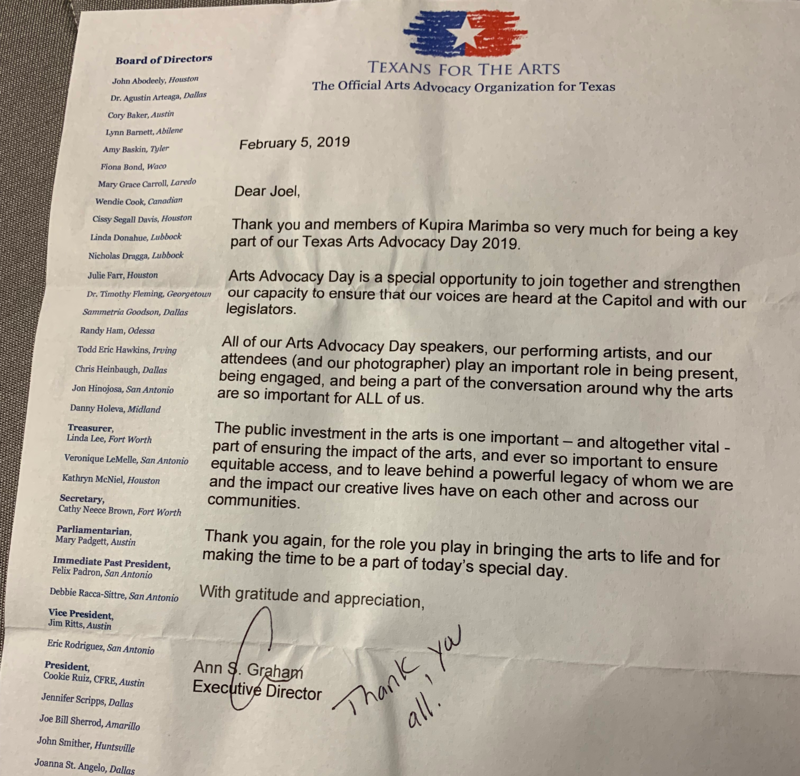 Texans for the Arts’ staff will pre-schedule office visits with attendee’s respective legislators and include that information in attendees’ packets. CLOSING RECEPTION & HAPPY HOUR for 2019 Arts Advocacy Day for attendees and all Legislators sponsored in part by the Texas Cultural Trust. Relax, review the accomplishments of the day, network while listening to live music by Cosmic and enjoying Happy Hour victuals. Special thanks to The Townsend Austin for their hospitality. 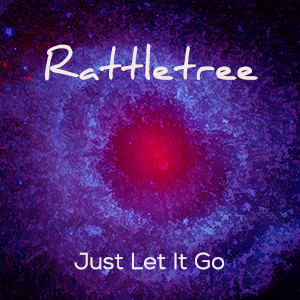 Want to download our latest song for free? Join our email list, and we will send you the link!